The background for Ron's House. Ron's House is a metaroom for Docking Station created by clohse, with some input from Liam, malkin and other Creatures Community members. 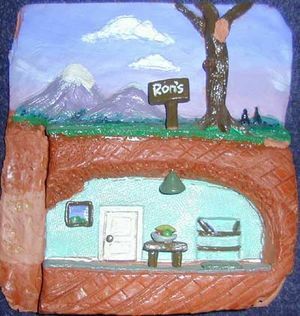 It was created using Steve Grand's plaster-of-paris prototype of Ron's Burrow (circa. 1995!) for the background artwork. The final version includes lifts, critters, all essential food groups, as well as a couple of easter eggs. Version 2, which hopefully will fix any map overlap problem, was hosted at Bibbleworld, but is currently available at TreeSprite's Grove. This page was last modified on 13 October 2017, at 20:02.